You may have heard a lot of buzz about the General Data Protection Regulation (GDPR), the European Union’s new privacy law coming into effect on May 25th, 2018. This privacy law is changing how companies acquire and use your information. While this specific law only applies to those in the EU, there are similar regulations in Canada and Australia and it’s likely they’ll eventually enact similar regulation in the United States. Due to this, many companies (including us at iClassPro) are making changes to become GDPR compliant. From May 10, 2018 on, when a customer creates an account from the parent portal they are asked to select a ‘yes’ or ‘no’ box. Answering “Yes, please send me emergency notifications and informational emails” will opt the customer in to receiving email blasts sent out from iClassPro. 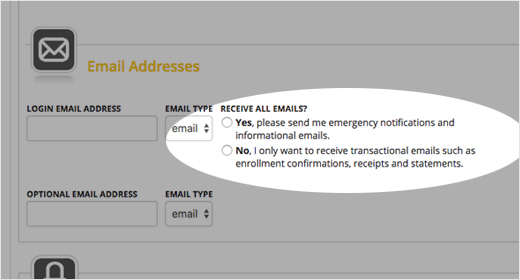 Answering “No, I only want to receive transactional emails such as enrollment confirmations, receipts, and statements” will leave the customer opted out of general communications sent by staff members through the email blast tool. 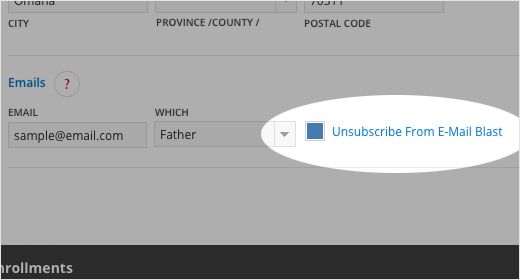 However, if a customer gives their consent to the business in person, a staff member can also opt-in or subscribe a family’s email address by editing the family and un-checking the “Unsubscribe from Email Blast” option from the admin portal. Customers are more likely to look for and open emails from your business, if they know to expect them. Customers are less likely to be suspicious and mark your communications as SPAM with their email provider (which could make future messages to that address undeliverable). As mentioned, it is illegal in some countries to send an email to a citizen of their country without their express consent. iClassPro cares about your business and we want to do everything possible to protect you from legal issues that may stem from improper use of data.